What if i am unable to attend a session due to any reasons? You must inform us 48 Hours prior to the expected absence and we will offer you a make-up session. In the event of travel, we can arrange to do the missed lesson before you leave or on the week of your return.You can always compensate for the missed classes. Do I need to carry my guitar for my classes? Yes! Guitar is the most dynamic instrument as well as the hardest to play! So we recommend you to get comfortable with your own instrument. But yes if a student is unable to carry his/her instrument for the session Guitar Hall will always provide them with one. What styles of music are taught? 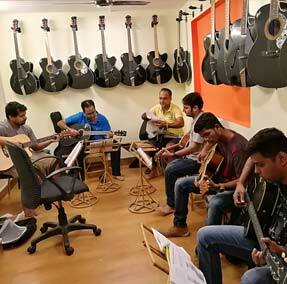 Our courses are designed for guitarists of every musical genre including blues, rock, pop and Indian music . Though the backbone of our syllabus lies on western classical notations. 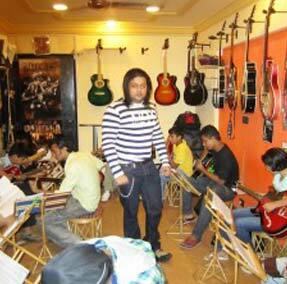 Kiran Roy has 25 years of experience in guitars and students would benefit a lot that’s guaranteed! No. We will provide you with all books, sheets, study material and instruments. Keep all your materials neat and bring them for each lesson. When do I pay for the Modules? On the day of enrolling you are supposed to make the payment, fill up the necessary forms and you can get going with your lessons straightaway. You will be learning directly under Kiran Roy, not his teachers, his students or his assistants! Ever! The teacher-to-student ratio will never exceed that of 1:6. Each student is monitored individually. All attending students will receive focused attention from us. Do you recommend an hour lesson or 2 hours lesson? All students can achieve enough direction and instruction in an hour. required to attend 2 hours session. How often am I needed to attend sessions? Twice a week attending 1 session on each days or once a week attending 2 sessions back to back on 1 day. Obviously, the more you practice; the faster you will notice improvement. On average, you should practice at least 30 minutes a day. Motivation to practice comes from within, from the desire to play something well. Be patient with yourself! 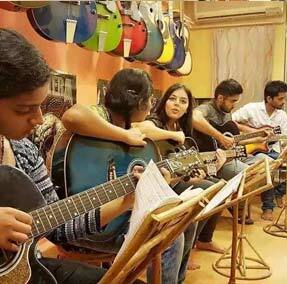 The atmosphere at Kiran Roy’s Guitar Studio is highly creative, but most importantly, supportive, inspiring, informative, challenging, non-competitive, relaxing and fun! We also accept all credit and debit cards apart from cash and cheque. In our academy there is always a fairly even mix of students in the age group of 13-60 attending. Our classes have students of all age groups,students of all professions, from diverse walks of lives like chartered accountants, doctors, pilots, lawyers, architects, engineers, corporate bigwigs, entrepreneurs, army/navy officers, fashion designers, models, actors, students, etc. depending on ability levels, experience, interest, and styles of those enrolled. Absolutely. You can’t learn horse riding without a horse!At every session right from the day you join our studio, lots of material would be taught to you in the class, which you are expected to practice at home, which you need to come prepared with for the next session. You need to show us that and then we proceed further. That’s how we function at our studio. Hence having a guitar at home is of paramount importance. What if I have no prior experience in playing guitars? Our modules and syllabus is designed for beginners as well as advanced students. Regardless of your musical experience, you will greatly benefit from our flexible program and a caring and knowledgeable teaching staff. How long does it take to get good in guitar playing? Exactly 7 months, 1 week, 3 days and 6.25 hours — just kidding!!! This is a tricky question because everyone’s opinion of “good” is different. The more you practice, the faster you (and others) will notice improvement. It is important to remember that music is an art form, not a competition like tennis. There are certain basics that one should learn and fully understand. Once that is achieved, more complicated material will be easier to comprehend. To actually play it will take practice, more for some and less for others. 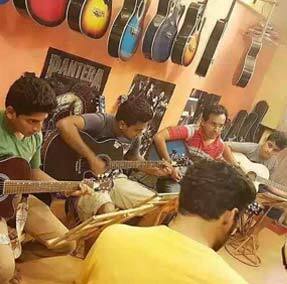 We have students coming from as far as Pune, Satara, Jalgaon, Bharuch, Vadodara on a weekly basis, students from Himachal Pradesh, Punjab and Uttar Pradesh have settled bases here to learn from us and students from all corners of Mumbai City attends lessons at Guitar Hall. So if you think you have the drive and the dedication like hundreds of our Guitar Hall students to excel in your craft you know where to head. By the virtue of our students attending Guitar Hall, we cater to all geographical areas and boundaries. Can teachers come to our house to teach? What will I learn with professional training that I can’t learn on my own? instructors will coach you on technique, which is paramount (something a DVD or the internet can’t do), introduce and explain you countless lessons which you won’t find anywhere, correct the flaws you have technically, correct you when you go wrong, keep you motivated and excited about music, expose you to many styles and teach you how to read music, tablature, to understand music theory and much more. Just like sports, investing and exercise, getting your information and technique tips from a pro is always the best choice in any situation. If this info is not sufficient you might as well watch TV instructions and learn cooking instead! If I haven’t practiced, should I come in for my lesson? Absolutely! You must keep your momentum and get back on track.